Their simple response is simply not to be forced into unnecessary polarities. Learn to balance gathering and sending/scattering. Now here’s the deal. I can’t distill for you in one post why this insight is more substantial than it sounds, so I’m sorry but you’ll have to read the book. (Better yet, watch Hugh’s videos!!!) But I will share a couple of insights that you might find helpful. The difference is in the arrows. If you’re new, begin by engaging culture from a life lived within the ways of God’s kingdom. Get a job. Be good neighbors. Visit the same coffee shop regularly. Make friends. Then as you live together with others walking in the way of Jesus, folks will become attracted to the quality of your relationships (both with God, one another, and themselves) and some will slowly become part of what you’re being. Community will form out of this, and as is appropriate over time you’ll add structure to what has now become a congregation. Brandon Hatmaker put some meat on this for us by talking about their threefold process of exposing needs by bringing them to people’s attention, guide people into a firsthand experience of those needs, and out of this most folks will engage needs with a desire to bless and serve in the name of Jesus. However you do it, from this the Spirit will probably generate a little momentum and gradually over time folks will be drawn into a way of being the church that goes far beyond two hours of spiritual consumption on Sunday morning. Couple more Missio-inspired thoughts and then we’ll be done for today. In order to be AND churches, we’re going to have to break the habit of wanting to hang out with people just like us. Generally speaking, what happens in churches (in our consumer culture) is that people find a church filled with people who want what they want. So folks who want “deeper teaching” go to Bible-teaching churches who spend 90% of their life together gathered around the word. And activist-type folks who want to make a real impact in the world go to justice- or serving-oriented churches where they spend most of their time scattered. Neither is a healthy, sustainable, faithful way of being and doing church. So if we’re going to move past the impasse, we must not expect everyone to see the world and the church’s mission how we see it. We’ve got to learn from each other and be challenged by one another’s natural priorities. And this shift must begin with the leaders. Paul talks in Ephesians about a fivefold model of church leadership that many simply call APEST or APEPT. It stands for Apostles, Prophets, Evangelists, Shepherds/Pastors, and Teachers. In the past decades the church relied mostly on Pastors and Teachers for leadership, along with an occasional traveling evangelist. In our brave new world most Apostles and Evangelists go plant their own churches. (And of course the prophets are in a corner somewhere calling down fire-rain on everyone else, or else quietly hiding the problems they see behind a desire to keep their jobs.) This way we once again get to kick it with our own kind, which we’d rather do anyway. But what we must do instead is create and maintain “churches” where each of these roles (and many more besides) are given space to do their part. Only then, we presume, will God’s people be adequately quipped for works of service, so that the body of Christ may be built up until we all reach unity in the faith and in the knowledge of the Son of God and become mature, attaining to teh whole measure of the fullness of Christ. The book sounds really good. Perhaps I should order it. 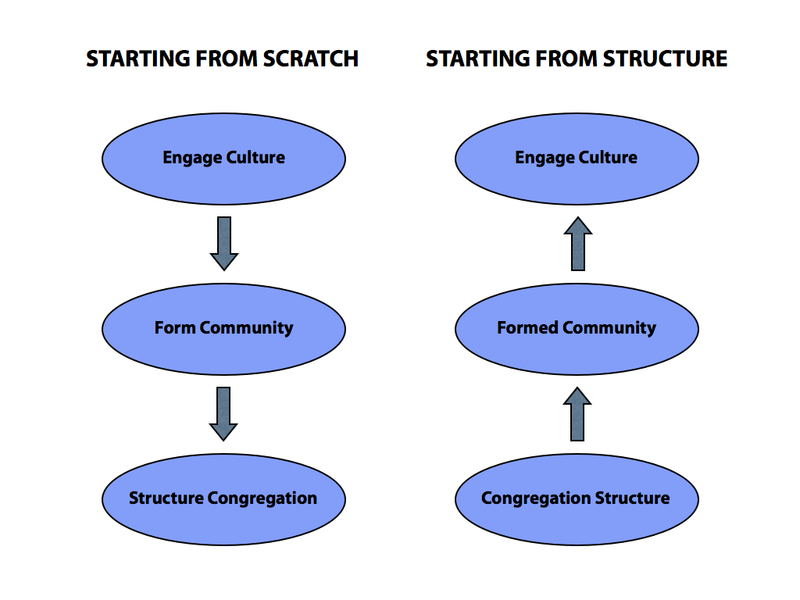 I fear the church “bubble” as I call it–the goal is a healthy mixture. Meredith, I’d love for you to read it! I’m considering it as something to have all new CT leaders read, so you can read it and tell me if you think that’d be helpful. I’ll have a copy for you Sunday. Sounds great–this was the area of my “next step” for me, our family, and hopefully life group too (as realized after Steve’s new class “Next Step”)–time to be stretched more.